Ultrasound assessment of pregnancy is now available onsite during your consultation at Eastbrooke Family Clinic Burleigh Waters! Dr Chris Briggs is able to provide dating and viability scans during the first trimester, and also general assessment throughout the pregnancy. This complements a thorough antenatal service provided at Eastbrooke Family Clinic Burleigh Waters. Dr Chris Briggs attended medical school at the University of Melbourne, before moving to the Gold Coast to undertake his training in General Practice in 2008. His main areas of interest are paediatrics, antenatal care, and family planning. In 2012, Chris attained the Diploma of Child Health, and from 2016-2018 was the first ‘GP with special interest’ to be employed to work alongside paediatricians in the children’s outpatient clinic at Gold Coast University Hospital, which reduced outpatient waiting times significantly. He sees a wide range of paediatric presentations. 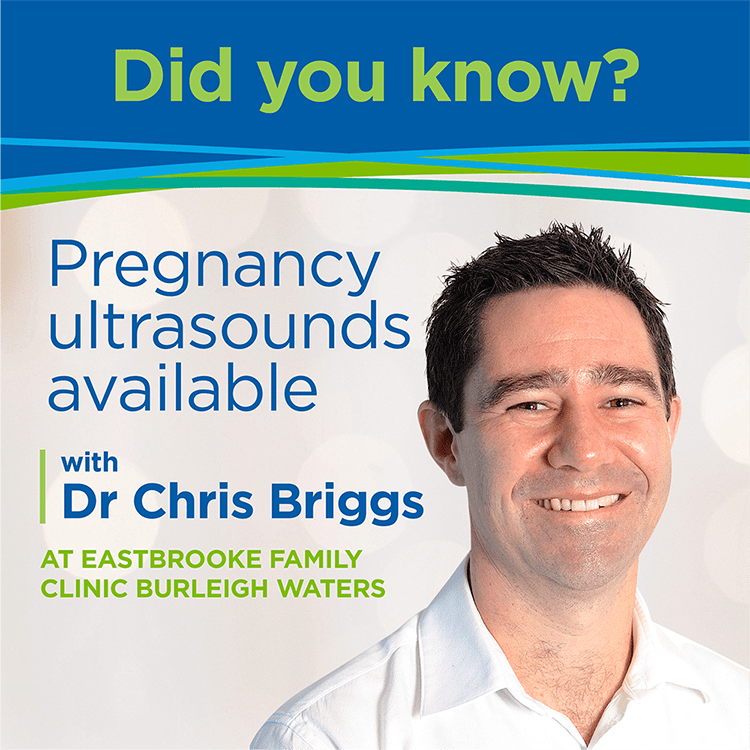 Dr Briggs has completed training in ultrasound during pregnancy, and is able to provide immediate ultrasound assessment of pregnancy during the consultation, something not often available in general practice. This extends his enjoyment of providing comprehensive antenatal care. He has completed the National Certificate in Reproductive & Sexual Health for Doctors, and also offers implanon, mirena and copper IUD insertion as contraceptive options. Dr Briggs also has an interest in medical education, working as a medical educator and supervisor for GP Training Queensland, and is an examiner of GP trainees for the Royal Australian College of General Practice. Most importantly, Dr Briggs endeavours to take an unhurried approach so that you feel understood, and leave with an understanding, not just a diagnosis. Visit our Facebook page for regular updates on Eastbrooke Family Clinic Burleigh Waters.